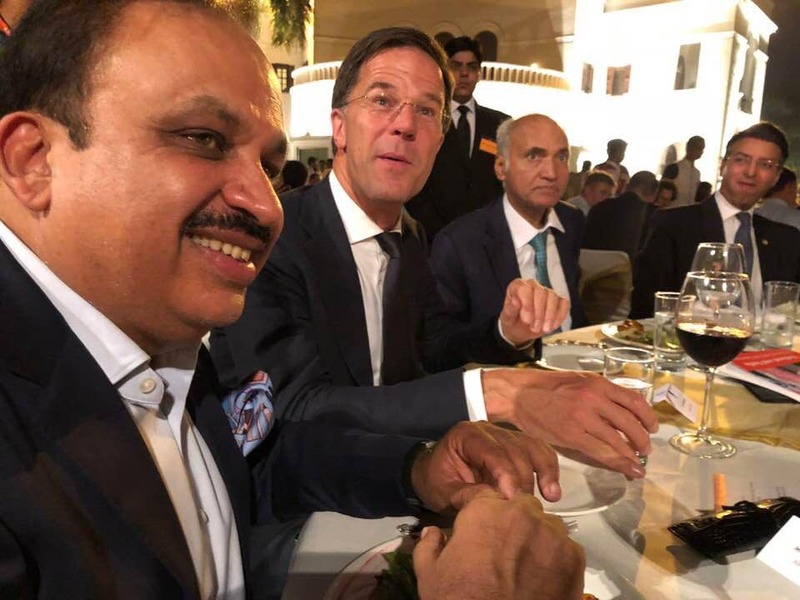 Ludhiana, May 27, 2018 (Iqbal Happy): In order to explore investment opportunities and synergies with businesses in the world’s most cycle friendly nation, Hero Cycles’ CMD, Pankaj M Munjal, met the visiting Prime Minister of the Netherlands, Mark Rutte and convened to discuss their mutual love for cycling over dinner. Netherlands is universally acclaimed for its ubiquitous bicycling culture which forms an integral part of the Smart Cities Mission of the Ministry of Housing and Urban Affairs of the Indian Government. Pankaj M Munjal could be seen cycling with Dutch Deputy PM, Kajsa Ollongren and Supriya Sule, Member of Parliament from Baramati in Maharashtra, as they discussed mutual plans for environment-friendly solutions to the urban problem of traffic congestion. The Netherlands also boasts excellent cycling infrastructure that promotes road safety and incentives for bicycle users. Mark Rutte was accompanied by his Minister for Foreign Trade and Development Cooperation, among others. About 231 delegates consisting of prominent Dutch businessmen and representing 130 well known companies are part of the Dutch visit. Among the various industries represented by the commercial initiative are logistics and smart cities, both of which consider cycling an integral instrument of provisions for last mile connectivity. Also accompanying the delegation is Kajsa Ollongren, Deputy Prime Minister, is the designated Deputy to the Official Head of Government in the Netherlands. “The Netherlands is said to have transformed commuting modes from motorized transport to cycling after witnessing alarming increases in road accidents due to motor vehicle congestion on the roads. It has the best cycling infrastructure and urban planning optimized for moving people and not vehicles. By learning from business models in the Netherlands, we hope to evolve to the same effectiveness in terms of solving the problems of road users for daily commute. At the same time, as the world’s largest single cycle manufacturer, we can contribute designs with our years of experience facing unique challenges in providing for the diverse geographies and uneven terrains of the Indian hinterland”, says Pankaj M Munjal, CMD, Hero Cycles. Hero Cycles has invested in a high end design unit in Manchester that is associated with designs of upcoming hi-tech bikes, and is in a unique position to leverage its reach in mainland Europe with its Insync brand, launched from the UK. The Netherlands is the leading nation in terms of a bicycling culture with the BBC reporting cycling use for commute reaching 70% in cities such as Amsterdam. Every household is said to have at least two bicycles. Roads often have separate, dedicated cycle lanes and even separate crossings and traffic lights. Because cycle lanes lead to places one can’t approach by car, road users are incentivized to travel by bicycle. There are special signposts and traffic signals exclusively meant for the cycle user. Even Prime Minister, Mark Rutte and other members of the Dutch government have often been photographed riding bicycles to work.